"Todor Kableshkov" University of Transport is a multi-profile university with over 90 years educational experience in the field of transportation and has been participating in the European higher education programme Erasmus since 1999. The University appreciates the importance of international cooperation through mobility of students and staff as a powerful instrument for the establishment of fruitful cooperation with other European universities. 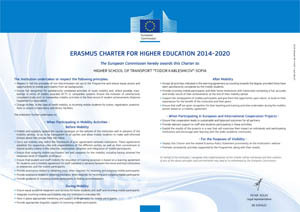 The University has been awarded the the Erasmus Charter under the Erasmus+ Programme, selection year 2014.